Ivey’s lawsuit against Tiltware reportedly seeks damages in excess of USD $150 million for lost income and business opportunity, and damage to his personal and professional reputation. The lawsuit was filed in the District Court of Clark County, Nevada and Ivey will be represented by Chesnoff and Schofeld in the case. David Chesnoff has previously represented celebrities like Lindsay Lohan and Mike Tyson, as well as poker pros Johnny Chan and Doyle Brunson. Full Tilt Poker has insisted it has had an Irish bank account unfrozen, despite the US Department of Justice officially denying that any funds have been released, eGaming Review has learned. Following speculation on various websites since eGaming Review revealed FTP had been able to access a sum amounting to more than one third of the funds owed to players, a company source told this publication the account in question is not one of those named in the original indictment, but a separate corporate account held with the Bank of Ireland. Consistent with his comments on Friday, the source explained that Full Tilt had to approach the US Attorney’s Office for the Southern District of New York in order to reassure the bank it was safe to unfreeze the account. “The bank was not one of those subject to the Department of Justice freezing order, but the DoJ did need to call the Bank of Ireland to get it unfrozen,” he explained. A spokeswoman for the Attorney’s Office confirmed to eGaming Review the unfreezing of any accounts listed in the 15 April indictments would be accompanied by an official press release, however she added there was “nothing in the public record” to suggest there had been “any unfreezing” and that it would be “published in the public record if that was the case”. Furthermore, when asked by eGaming Review about the alleged contact between the DoJ and the Bank of Ireland, the spokeswoman refused to deny this as a possibility. At the time of writing the USAO was unable to confirm whether it had been approached by Full Tilt over the unfreezing of non-indicted accounts. When asked whether the DoJ would unfreeze any Full Tilt accounts in order for funds to be returned to US players the USAO spokeswoman said she was “unable to speculate about future events”. The Bank of Ireland refused to comment on matters regarding Full Tilt Poker. 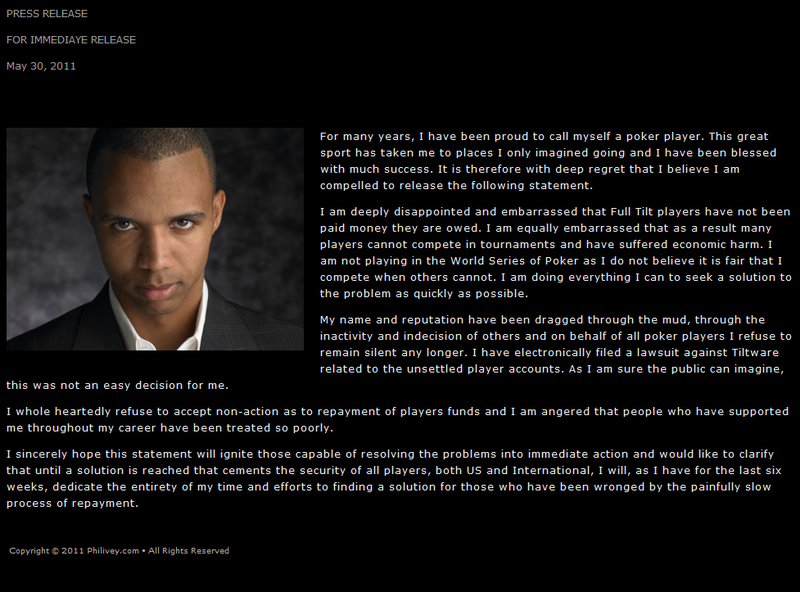 The Tiltware statement, relayed through Pokernews, goes on to suggest that “Phil Ivey’s meritless lawsuit is about helping just one player – himself. At the time of writing, eGaming Review is awaiting further comment from Tiltware’s legal representatives in the case, which has been filed in the District Court of Clark County in Nevada. Don't miss out on egaming news: sign up for our free, daily Snapshot email. Or get the news as its breaks with the free eGaming Review RSS feed.